We thank you for visiting our website. If you have any questions or would like to schedule an appointment with one of our attorneys, please feel free to email us by submitting the information below. One of our attorneys or staff members will contact you as soon as possible. If you need immediate assistance and would prefer to contact us by phone, you may do so at (812)945-2555 between the hours of 8:30 a.m. and 5:00 p.m. Monday – Friday. 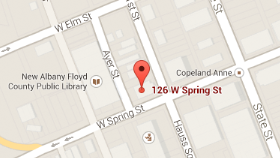 If you would like directions to our office, please see our directions page or visit Google Maps.